Through extensive illustrations, archaeological reconstructions, and up-to-date texts, this companion volume to The Treasures of the Egyptian Museum presents an in-depth consideration of the entire complex of funerary monuments on the west bank of Thebes, opposite the modern city of Luxor. Against the background of the superb natural scenery of the Theban mountains and the surrounding desert, tombs and sacred buildings of incomparable beauty were constructed that thave impressed visitors since the times of the ancient Greeks. Recent archaeological research allows us to wonder at the imposing architecture of the temples and to appreciate the marvels inside the tombs that were built to perpetuate the memory of the kings and queens who have rightly been called the ‘’’first individuals in history.’’’ The book takes the reader on a journey through the Theban tombs and sacred buildings with the aid of photographs and detailed drawings created especially for this book. 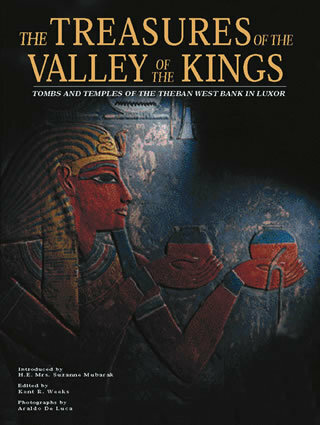 Guiding the reader in the discovery of the treasures of the Valley of the Kings through texts written by some of the world’s foremost Egyptologists, this volume is a compendium of the most advanced archaeological research carried out on the west bank of the Nile. It is a fascinating journey into the ancient heart of a country that has always been at the center of human history.